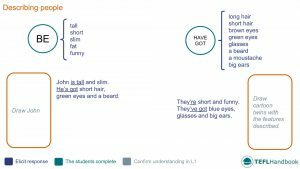 This ESL lesson plan contains activities and games for teaching beginners how to describe people using the verbs 'to be' and 'have got'. The best way to view this content is through the TEFL Handbook app. If you have an iOS or Android device, be sure to check it out. The sample board below acts as a warm-up or lead-in activity for the target language in this lesson. Start off by adding both verbs and eliciting the adjectives associated with each. After that, draw some characters on the board and elicit sentences that describe them. The class will help you to write a description of yourself. You are going to write a description of yourself on the board in the third person. Elicit as much as possible from your students and have them copy what you write. If you have used the sample board, you could leave the list of adjectives at the top and pull from that. Students have to write a description of themselves. Using the board work as a guide, each student will now write a description of themselves. Fast finishers can come to the front of the classroom to read their work. The students have to swap books and describe their partner. 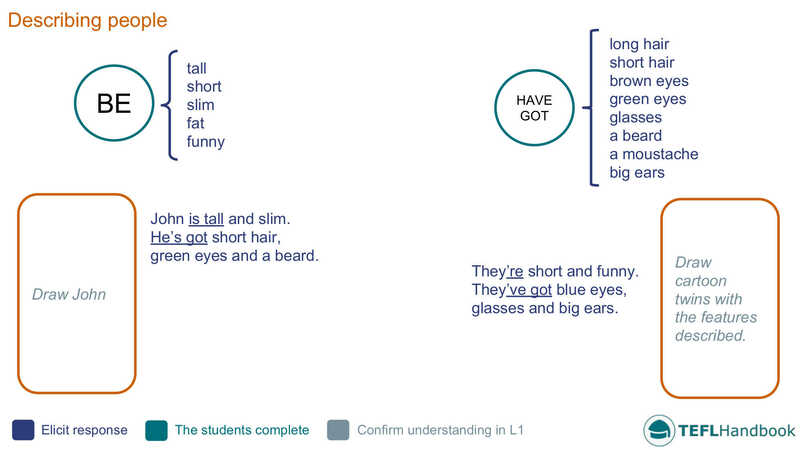 Before they begin, remind them of the correct forms of the verbs be and have got in the third person. Each student describes a famous person or well-known fictional character while their classmates attempt to guess who it is. Start by telling your students to choose a famous person or well-known fictional character to describe. Give them a few minutes to think about how to describe their choice. They can write it down if they wish. When they are ready, go around the class and elicit the descriptions. Encourage the other students to guess and ask follow-up questions when a student has finished describing their choice. Students have to describe another classmate to their partner. Start by splitting the class into pairs. On each turn, one student will sit with their back to the rest of the students, facing their partner. The teacher points to one of the students behind the hot seat. The student in play must then describe the chosen student to their partner in the hot seat. Depending on the age or level of the students, set a time limit, or limit the number of guesses to one or two. We hope that you were able to grab a few ideas from this lesson plan. Our suggested next lesson focuses on questions about time. Also, be sure to check out our full list of ESL lesson plans for beginners (A1 Upper), as well as the complete collection.